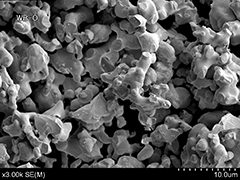 Boride Powders｜JAPAN NEW METALS CO., LTD.
Metallic boride powders are very unique functional new ceramic materials. They have a high melting point, high hardness, good electrical conductivity and thermal conductivity and are used as heat-resistant and hard materials that can be accurately processed by electric discharge machining. Demand for TiB2 as an ultra-hard material is growing, which is also used in corrosion-resistant materials and evaporation boats. ZrB2 has a high melting point, hardness, electrical conductivity, and heat conductivity. Its properties are utilized in heat-resistant ceramics, fire-proof materials, and super-hard materials. CrB and CrB2 have better oxidation resistance than other borides so they are suitable for extenting the life of fire-proof materials and heat-resistant coating. MoB and WB are highly regarded as wear resistant and corrosion-resistant materials, and also are important as the major ingredients in iron and nickel boride compound cermet materials. LaB6 has outstanding thermal electronics emission properties, which is used to develop new application in a variety of cathode materials. It is also one of the major material for heat ray shielding thanks to the property of superior near -infrared ray absorption. FeSi2 has becomes the remarkable for high temperature thermoelectric material. （*2）Products marked with *can be produced on order. （*3）TiB2-NF and HfB2 is a restricted item by Japan's export control regulation.